Serving: Pearland, Friendswood, Alvin, Manvel, Santa Fe, Rosharon, Fresno, Angleton, Lake Jackson, League City, Pasadena, Deer Park, La Porte, Clear Lake Area, Seabrook, Kemah, Dickinson, Texas City, and most areas Southeast of Houston. 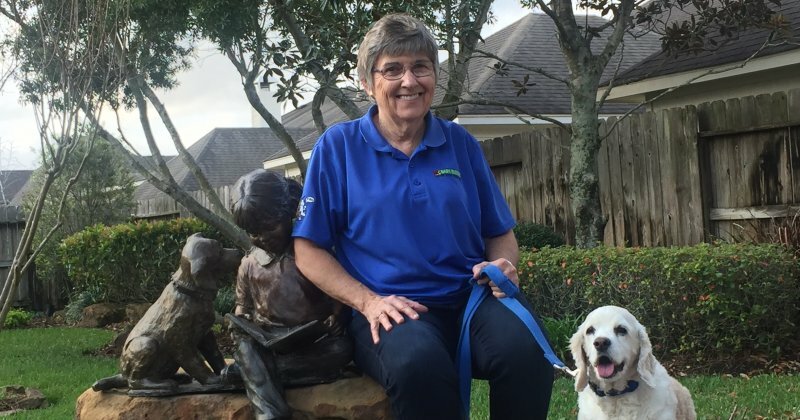 Connie Archer is the owner of the Houston South Bark Busters office and has now trained well over 1,500 dogs in the Houston area. She is a graduate of Bark Busters Training Academy in Englewood, Colorado, and has completed both Basic and Advanced training programs. Now with twelve years of experience, Connie is ready to show you how to change your relationship with your dog from that of frustration, stress and embarrassment to one of calm, control and pride. We work with you to develop a custom-tailored training program that suits you and your dog’s relationship, your lifestyle, your schedule and your goals! We teach you how to correct misbehavior as it is happening. You get one-on-one attention geared toward the real life issues that concern you the most. With the initial visit, you will begin to see big changes in your dog’s behavior. With conveniently scheduled revisits and short periods of daily practice, you will soon have the well-behaved and happy dog that you have always wanted. Bark Busters proven system teaches you to think and speak canine. We use positive, non-physical (no choke, pinch, prong or shock collars), natural techniques, based on body language and vocal communication to get your dog to focus on you and respect you. The methods are simple and work for all breeds and all kinds of behavioral issues. Connie will assist you in finding solutions to embarrassing and potentially dangerous problems such as jumping on people, nuisance barking, aggressive behaviors toward other dogs or people, pulling on the leash, separation anxiety, and destructive behaviors such as chewing and digging. We work with all breeds and all ages to fix all types of problem issues. Connie can get your brand new puppy off to the right start or work with your grown dog to solve any behavioral problem. Young puppies are eager and ready to learn and, yes, old dogs can learn new tricks. NEW PUPPY? NEED HELP WITH POTTY TRAINING? You can get your puppy started off on the “right paw” by eliminating behavioral issues before they even start. A puppy’s brain is like a big sponge, and by coming to your home, the Bark Busters trainer can begin working with your puppy at a very early age, without the fear of exposing him to unknowns prior to completion of his vaccinations. We work hard with our local veterinarians because we believe that you will realize the greatest benefits through a cooperative program that looks after both your pet’s medical and behavioral issues. Connie is recommended by many of her area veterinary offices.